2018 proved to be an important year for UK gambling regulation. While UK licensed gambling operators have been subject to strict regulatory standards since the Gambling Commission was set up under the Gambling Act 2005, last year saw a number of changes to gambling regulation that will impact both land-based and remote gambling operators, including sports betting businesses, in the future. With 2,820 UKGC licensed gambling operators in 2018, these changes have had and will continue to have, a widespread impact across the country. New regulation has been introduced in a bid to increase consumer protection and ensure that operators are making gambling as safe and fair as possible. But why were these changes introduced, and what did they look like? From changing advertising laws to tax increases, Casino Genius takes a closer look at the key changes to the UK’s gambling regulation in 2018 and what this means for gambling firms in the future. The ultimate aim of any change to UK gambling regulation is to support the Gambling Commission’s broader mission to ensure that gambling is fair and safe for everyone involved. With evidence that consumers weren’t being treated fairly by gambling operators, it became apparent that public trust in gambling was on the decline. On top of this, these changes were implemented in a bid to address serious failings regarding compliance with UK consumer law and advertising codes, as well as the protection of children and other vulnerable people from the potential dangers of gambling. It’s for these reasons that there has been widespread support for regulatory changes, not only from consumers and regulators but even from those within the gambling sector. Operators must take care to avoid wording that gives a skewed perception of the risk associated with gambling, or the control that customers have over it, such as through so-called ‘risk-free’ bonuses’. operators are obliged to offer more in-depth information on problem gambling behaviours and indicators of associated behaviour. offer marketers more in-depth information on how to protect vulnerable people from the dangers of gambling. must not spam UK consumers by email or SMS and must not contact consumers with direct e-market without informed and specific consent. Towards the end of the year, the Remote Gambling Association (RGA) struck a deal that called for a whistle-to-whistle ban on gambling advertisements during televised sports events, supported by operators such as Bet365, Ladbrokes and PaddyPower. The Industry Group for Responsible Gambling (IGRG) confirmed that the change will come into place in 2019. Under the changes, it will be forbidden to broadcast TV gambling ads five minutes before or after a sporting event is broadcast, if it begins before 9 pm, including pre-watershed reruns and highlights shows. Despite the exemption of horse racing and greyhound racing events, as well as perimeter gambling ads and players’ shirt sponsorships, the ban has been deemed a “welcome move” by Jeremy Wright, Secretary of State for Digital, Culture, Media and Sport. The change has been a long time coming, with reports that the ASA received 115 complaints after 90 minutes of gambling ads were broadcast during the 2018 World Cup. The UK isn’t the first of European countries to restrict gambling advertisements. Gambling ads in Italy were banned from TV, radio and internet, from 1st January 2019, though operators with existing agreements will be given until 30th June to end the contracts. In addition to this, the Irish President has voiced his concerns and called for a ban on gambling advertising in the country, but there is yet to be any progress on creating legislation. New rules introduced in 2018 sought to address issues of customer trust. As of 31st October 2018, gambling operators had to implement changes to make their complaints process fair, open, transparent and effective. These new rules, also covered by changes to the LCCP, saw the introduction of a new eight week limit on customer complaints, meaning operators would have to resolve any customer complaints within this timeframe. publish information to help instil confidence in their service, including how they’re independent of the gambling business and funding and detailed information about how they work (including methods, timescales and performance data). This regulation comes as part of a broader mission to put consumers first and means that complaints will be dealt with more swiftly. This new regulation was originally due to come into play in October 2019, but due to increasing pressure on the government, the change in law has been brought forward to April 2019. Crouch went on to say that, “while we want a healthy gambling industry that contributes to the economy, we also need one that does all it can to protect players.” This recognition demonstrates that having a healthy gambling industry in the UK is about so much more than maximising profits for operators, and involves protecting players as much as possible. The government also announced an increase in the tax remote gambling companies would pay in the net financial year. Remote gaming duty (RGD) will increase from 15% to 21% from April 2019, and is set to offset the financial loss that will occur as a result of lower FOBT stakes. This increase in RGD will affect companies that allow gaming over the internet, telephone, by television, radio or other electronic communications. The 21% tax rate will apply to any profits made on or after 1st October 2019. 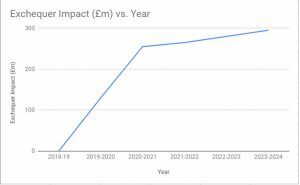 The 6% tax increase is predicted to make £130 million for the Treasury in 2019-2020, and almost double over the following year, according to the 2018 Budget Policy Costings.